Sometimes the thought of going out and about with cloth nappies when you are first starting out can be a little bit daunting. What do I need? What will I do with the poop? Am I going to have to cart around smelly nappies with everyone giving me strange looks? Don't’ panic! It really is just as simple as going out with disposable nappies (but far more stylish of course). A number one rule of parenting is to be prepared, if you have everything you need to hand, then it will be as smooth as a hot knife though butter (as a friends husband once described birthing a second child to me). • Enough cloth nappies to last the period you are out for plus one extra, four always seems like a good number! Whatever cloth nappy system works for your family will be easy to take out and about. If you choose TotsBots Easyfit or Teenyfit Stars they are simple as an all in one, no fuss. PeeNut pads and wraps can be great when adventuring as you can wipe down the wrap and reuse with clean PeeNut pads. This reduces the amount quantity or bulk of nappies you need to transport which is good if you are out for a walk or babywearing. Its also very easy to transport wipes with you. Disposable wipes seem so convenient but actually cloth is just as simple and more eco-friendly! You can take dry wipes if you are going to be near facilities or take a small bottle of water and dampen them as you go. Alternatively, soak before you leave the house and voila you've got ready made wipes. Something that is always handy to stuff in your change bag is a source of distraction like a toy or small book. Most of us know that changing a toddlers nappy is like wrestling an octopus smothered in baby oil so any help is much appreciated. The same applies for weekend breaks, camping and holidays, If you are prepared then anything is possible. Even without washing facilities (as long as its not weeks on end) it is possible to cloth bum whilst you are away. It means a bit of an epic wash on your return but lets face it, we’re parents so thats nothing new. This post was written by the lovely Heather at A Reusable Life. Heather is mum to two boys, Arthur and Eli. Her passion for all things reusable started off with cloth nappies after using them with both of her boys. 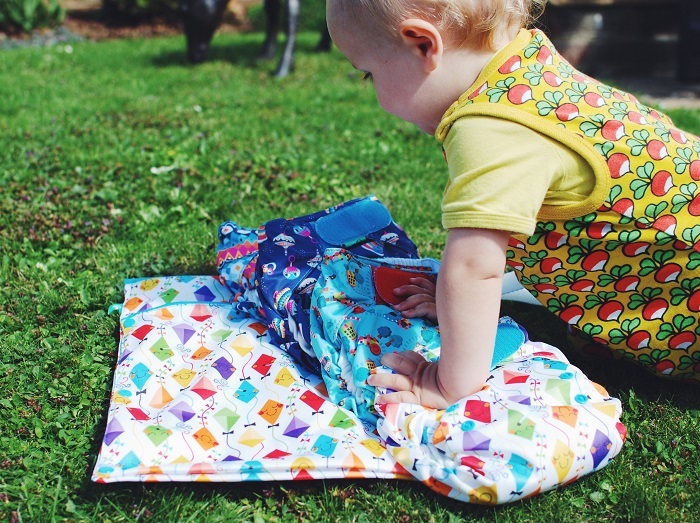 She is a bit of a nappy guru and certainly knows her stuff when it comes to getting out and about with reusables! Easyfit Star Video from Toad's Caravan! Cloth Nappy Myths - Busted!